How to have digital marketing that works. Whether you call it an avatar or a buyer persona, actually identifying and finding your ideal customer is not always an easy task. In a perfect world, you want every aspect of your business, from your website to your elevator speech, to connect with the people who need you most and can pay you. But you’re often too close to your business be in a place of total clarity. Moreover, it’s sometimes too scary to think about your business being built around one type of person. But there’s no time like now to shed your resistance and dig into this stuff. Most businesses that are not clear about their ideal customers are simply not asking themselves the right questions. So, today is your lucky day because I’ve compiled a list of important questions you must to ask yourself to find your ideal customer. Answer them all and you’ll discover it’s not so difficult after all. The process of identifying your ideal customer will help you solve tons of business challenges from marketing, to promotion, to effective speaking, to networking. It takes some time at the beginning but it keeps on giving! What does your product or service accomplish from your customer’s point of view? What are the specific benefits your customer is seeking in buying your product? What is the location of your exact customer? When does your ideal customer buy your product or service? What is your customer’s buying strategy? Online marketing has made it urgent to know exactly who your ideal customer is. It’s now estimated you have only one-twentieth of a second to make a connection that sparks interest online. I went to a trusted digital marketing source for more tips on finding your ideal customer. What are your ideal customer’s goals and values? What would be his or her objection(s) to buying your product or service? I’ve dedicated my business to providing the guidance and coaching in this area. Over the years, my process has evolved and the amount of questions my clients must answer has grown. This exercise takes time (and sometimes a lot of angst), but the payoff is totally worth it. What is this person’s gender? What is this person’s marital status? What is this person’s level of education? Does this person live in an urban, suburban, or rural community? What religion or ethnicity is this person? Does this person have children? Do the children live at home? 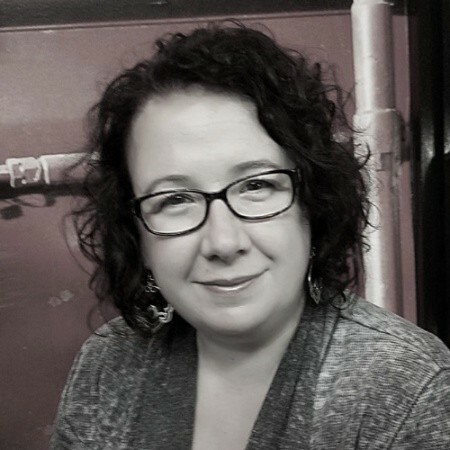 Is this person the children’s primary caregiver? Is this person caring for aging parents? What is this person’s annual income? What type of work does this person do? Is this person self-employed or does he/she work for a company? 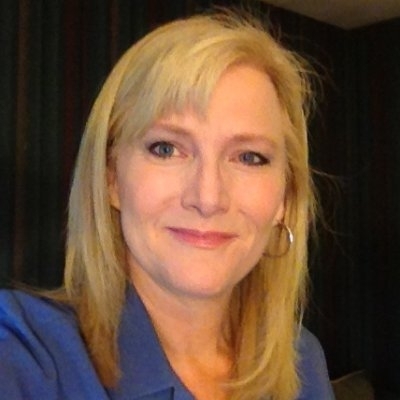 If this person works for a company, is it a corporation, a small business, etc.? What are his/her passions and hobbies? Where or what was his/her last vacation and why did this person love it so much? What type of neighborhood does this person live in? Where does this person buy groceries, and why? Where does this person buy clothing/shoes, and why? What are some of his/her favorite clothing brands? What kind of car does this person drive , and why? Is this person active with his/her church, belong to a country club, participate in charity events? What brand or product has so changed this person’s life that he/she now could not live without it, and why? Where does this person get information? Newspapers, blogs, books? Print or online? Does this person watch television? What are his/her favorite shows? Who does this person admire the most? What would people be surprised to find out about this person? What makes this person stay up at night worrying? What makes this person stay up at night worrying about that directly relates to what you have to offer? How would you characterize this person’s relationship with his/her immediate family? What recently happened that made this person search for information as it relates directly to what you offer? What did this person already try that didn’t work and is the reason he or she is coming to you; are you introducing something never tried before? The internet has leveled the playing field for competition among small and large companies. Potential customers use the internet to research companies long before they contact them directly. Inbound marketing is customer-centric not seller-centric. You have nurtured the relationship so they become a customer. Now What? Your competitors want your customers as much as you want them. Remarkable content offers must be made to existing customers to keep them. Analytics That Profit ™ takes a very deep dive into your analytics to provide you with meaningful business intelligence to identify what is working and what is not. It is not about Impressions, Clicks or Likes. It is about conversion and revenue generation. Visit our HubSpot Partner page for more useful tips and tricks. Content Marketing is a strategic method for using data surrounding your ideal customer. 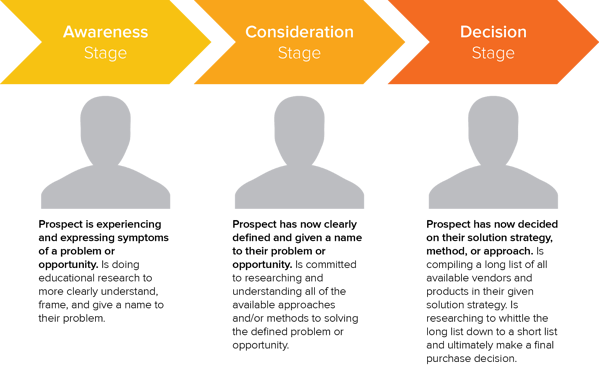 Research has shown that by segmenting your ideal customer into Buyer Personas, you can better understand their decision-making process and provide content for each step in their process. This strategy is highly effective for B2B and B2C companies. Why? Google has provided research to show that 89% of individuals in the B2B procurement process use the internet to evaluate suppliers. Your ideal customer is researching specific capabilities, tolerances, and standards when they search. Picture the impact on your bottom line if your business showed up in that search. 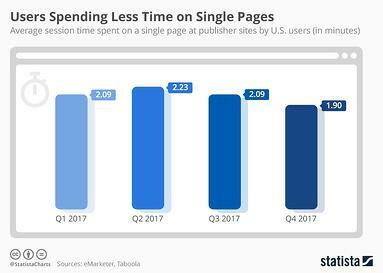 As user attention spans get shorter, it is now more important then ever to grab your users' attention with your content. Providing content your users actually want will help keep them informed and educated on your products and services as they move through the buyer's journey. SMBs that use content marketing get 126% more leads than those that don’t use content marketing. They purchase solutions to problems! Have you made it clear how your product or service solves the problem? Is Your Marketing Content Confusing? The reality is that over time, you may have many different individuals and agencies involved in your marketing. This is particularly true for your website and social media. With all these hands stirring the pot (potentially, multiple pots), are you delivering a congruent message to your target audience across platforms? When your target audience visits your Facebook, Twitter, LinkedIn page, or your website, is it obvious that they are visiting pages for the same company or is your marketing content confusing? We see 3 commons problems when looking at social media and websites that can make your marketing content confusing. Website Homepage- You don't have to say everything on one page. Your homepage should be organized to make it easy for your audience to navigate to the information and content they are seeking. An over-cluttered homepage is a common problem for manufacturing and B2B companies with many service offerings. To avoid this problem, use product-specific pages to house the details of your product and service offerings. A well-constructed homepage will get visitors to the product-specific pages they want to read. A good example of a website with an abundance of information but an easy-to-navigate homepage is the FDA (U.S. Food & Drug Administration). The navigation menu sits across the top of the content, allowing users to quickly find relevant information. There are also audience-specific guides on the right side of the page, allowing each persona to find content that is specific to their needs. If you are having difficulty cleaning up your homepage, maybe you have not clearly defined your target audience. 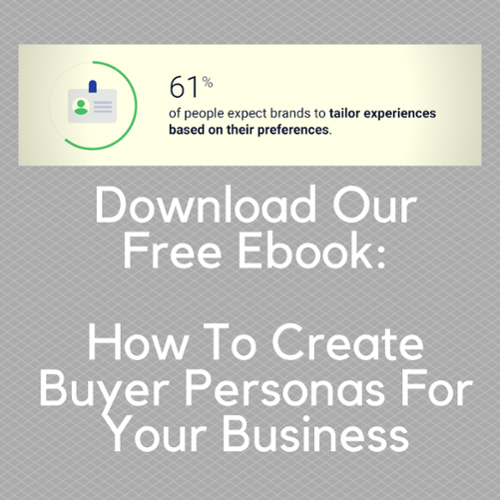 Take a look at How To Create Buyer Personas For Your Business. Use highly focused social media messaging to send visitors to the appropriate content-specific page based on the content in your messaging. WTF? Why That Font?- Much research has been conducted on fonts and their psychological impact on perceived difficulty of accomplishing a task. Font selection will affect the perception of how easy or difficult it will be to do business with your company. Read the research and select the appropriate font from the typeface family that sends the message that your target audience wants to hear. That Buyer Persona thing is becoming really important now. Avoid mixing multiple fonts and typeface on the same page. A best practice is to have a company style policy. Pictures/Images/Graphics- One size does not fit all! Company Brand and Logo should be uniform across all social platforms and your website. It should be obvious when I click from your Facebook page to your website that it is the same company providing the same message. Hire a professional to do your design work. A qualified professional will completely understand the requirements for all platforms and will adjust any graphics and content as needed. If you want to audit your current images for optimal size, download The Ultimate Guide To Image Size. Don't make your marketing content confusing! Define your target audience. Articulate your message. Make it easy for visitors to find the content they are seeking. Simply put, a content offer is something your ideal customer sees as a value add and is willing to exchange information for the content offer. They are part of the GIVE/GET strategy. I like to read books. It is also true that I rarely finish one. There are literally stacks of books in my office with bookmarks in them. Why? I read mostly nonfiction; I read to find the information I am looking for and move on. 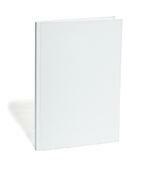 Imagine a blank book cover. Would you open the book if you had no idea what it was about? Unless you were really desperate, the answer is probably no. This is how Technical SEO applies to your website. How do you use Technical SEO to drive more traffic to your website? A sitemap informs search engines about how your website is organized and what content it contains. Just like that blank book cover does not really motivate you to open the book, a website without meaningful pages titles leaves search engines scratching their heads and website visitors confused. Think of meta descriptions like all those notes on the back of the book cover that make you want to open it and see if it really is that good. Heading Tags are like chapter titles in a book. They are part of an SEO strategy to align Page titles, Meta Description, and content. H1 Heading Tags can be thought of as chapter titles in a book. Other Heading Tags like H2, H3, etc, are like those words under a chapter title in a book that tell you what to expect. What is structured data? This is code that is added to specific webpages to allow search engines to better understand what is on the page. Structured Data is very useful for Blog Posts, Product Pages and Service Offerings. Not sure if your website is doing any of this? These questions are frequently asked by business owners and marketing managers. Why? If you can understand what is bringing visitors to your website and what makes them stay you can easily grab opportunities to bring more people to your website. Great news! You do not have to be a marketing expert or SEO guru to figure this out. 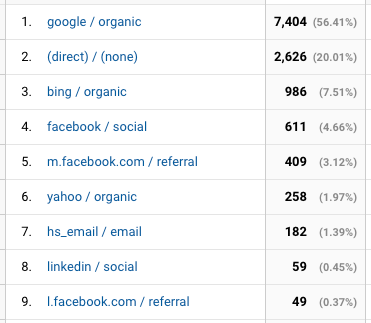 Google Analytics has done the analysis for you and provides it at no charge. Google Search Console used to be called Webmaster Tools. It is very easy to install and does not require a webmaster. In Google Analytics, click the gear at the bottom to open the Admin tab. Once there, Click All Products. 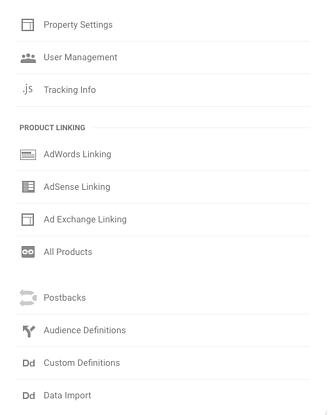 After you have clicked All Products, look to see if search console is connected. If not, follow the directions to connect. You are now ready to rock it like Davy Crockett. In Google Analytics click Acquisition and then click Search Console. The first place we like to look is Landing Pages. Add the secondary dimension of Source/Medium to find out which organic content is getting the best traction. It will look like this. As you can see from the image, Google has done the work for you. A favorite place to start for us is Low Bounce Rate and poor Average Position. A low bounce rate means the content is engaging and moving buyers through the website. Improving SEO for these landing pages is low hanging fruit. If you click the Landing Page in Google Analytics it will provide you with the actual queries people used that made your content appear in their search results. Now get to work and improve the content and meta description and this will improve your ranking in search. How much would you pay to know what search terms made you show up in search results?Google provides this free of charge in Search Console. Could you improve SEO if you could build content around these terms? Yes! All this information is provided in Queries in Google Search Console. We like the add in from KeywordKeg that provides Monthly Volume, CPC and Competition. High Monthly Volume and low Competition ( the bigger the number the greater the competition) are great opportunities to focus on improving SEO. Remember, search engines like Google hate keyword stuffing. Keyword stuffing is just throwing the word on page as many times as possible without context. Take your time and write content that incorporates the keyword or phrase in a natural context that is beneficial to the reader. While it is important to write for SEO, a human being is actually going to read it. 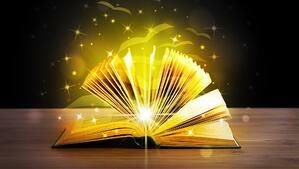 Readers bounce off your website, not search engines. Connecting Search Console in Google Analytics provides a wealth of information to help you improve SEO. We highlighted these 3 Ways To Use Google Analytics To Improve SEO. There are more. Ready to talk about them? You don't sell a product directly on your website. There is no shopping cart. How do you know if your website is actually helping people buy your product or service? Now let's complicate it further by asking what role social media played in bringing buyers to your website? These are complicated questions and you would think you need a complex solution to answer them. Do you need to purchase special 3rd party software? Would it be better to pay a developer to write a custom program for your unique business situation? There is a simple solution to this complex problem. It is likely that you already have Google Analytics on your website. If not, it is free and is simple to install. You do not need any special coding skills. Follow these simple steps to install Google Analytics. 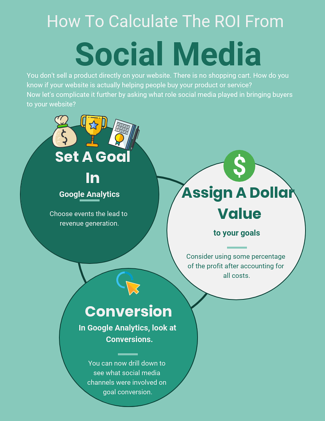 Once Google Analytics is installed you are ready to measure the impact of social media in the buying process. 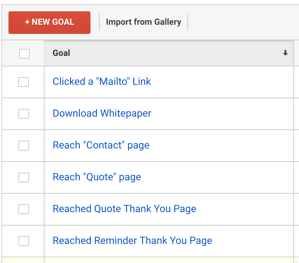 Choosing a goal in Google Analytics is simple. Choose events that lead to revenue generation. It can be as simple as Quotes Submitted, particular Downloads or number of Downloads, Specific Time On Page, or Watching a Video. Click here to see what Google says about setting goals. Here are some examples of goals that lead to revenue generation. 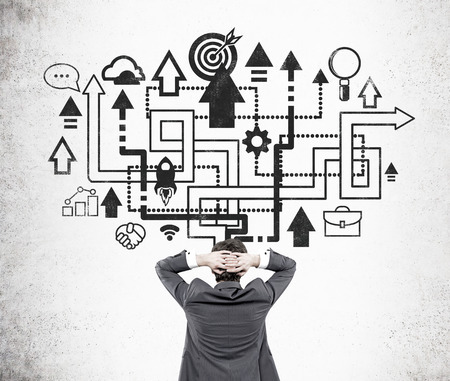 It takes an understanding of your business processes to select the correct goals. When selecting goals it is best practice to include all those involved in the sales process so proper attribution can be assigned. 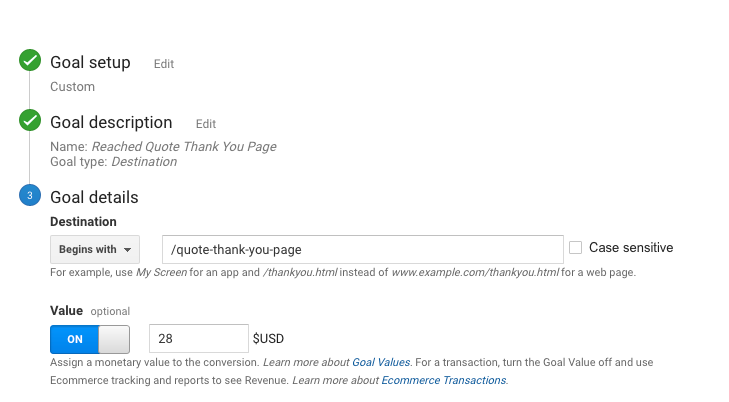 ProTip- Create a Thank You page for all completed activities that are related to revenue generation. Make the Thank You page the goal. Your gut reaction might be to assign Total Sale Value as the monetary value of the goal. The problem is you have not accounted for all costs. We recommend that you download our ebook Marketing Metrics Your Boss Really Cares About for the methodology of calculating ROI on marketing. Consider using some percentage of the profit after accounting for all costs. 1. Collect Data over a Specified Time Range - 30 days is OK, but 90 days is better. 2. Reevaluate your goals to make sure you did not miss any "key" revenue generating activity. 3. Determine the monetary value from website generated revenue based on goal completions. 4. Assign Monetary value in Google Analytics. 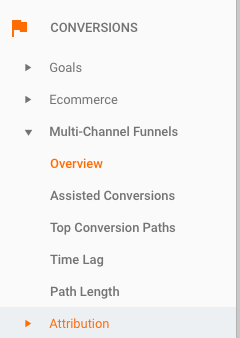 In Google Analytics, click Conversions. You can now drill down to see what social media channels were involved on goal conversion. 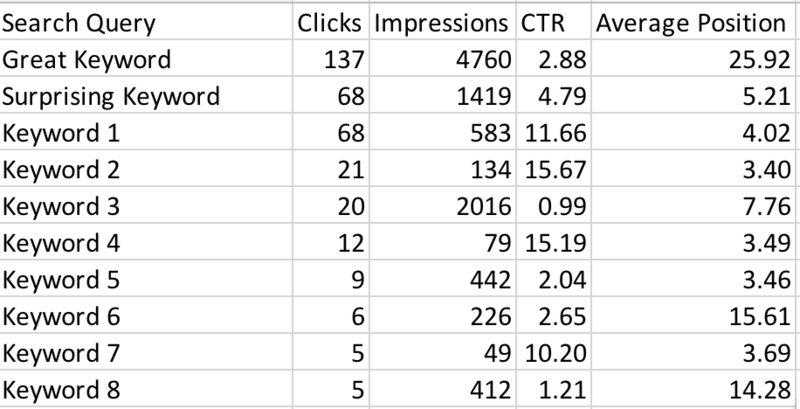 In Overview, you can simply click Source/Medium and you will see which social media platforms contributed to conversions. You can also click Goal Flow and see how visitors entered from social media and what path they took to arrive at the goal. Now take a look at Multi-Channel Funnels. This provides a holistic overview of how they reached the goal. You can then look at Assisted Conversions and see the monetary impact of social media . You can now calculate the ROI from social media. This is also a gut check. Google Analytics has no emotions so you are going to see what is really going on with your marketing. The winners and losers. If your social media is not having the revenue generation impact you had hoped, maybe we should talk. Social media doesn’t just belong to Marketing anymore. Actions that a social media manager takes can seriously impact all other departments such as Sales and Support, and it’s something to keep in mind when monitoring. According to research from Social Centered Selling and A Sales Guy, 72.6% of salespeople who incorporated social media into their process outperformed their colleagues. In addition, socially savvy reps beat their quotas 23% more often. We call this social selling. A new study released by BRANDfog suggests that social CEOs are better leaders who can strengthen brands, build trust in products and services, demonstrate brand values, and communicate accountability -- all by simply being on a social network. In anything you do, it’s important to set a goal for yourself, and monitoring social media should be no different. That’s why it’s critical to set SMART goals. Attainable -- Do work toward a goal that is challenging but possible. Don’t try to take over the world in one night. Realistic -- Do be honest with yourself, because you know what you and your team are capable of. Don’t forget any hurdles you may have to overcome. If you’ve never set a goal for social media monitoring before, start by aligning your monitoring goals with your department’s goals. For example, if you’re monitoring from the Sales department, maybe you should set a goal for yourself to interact with 10 prospects per week on social media. 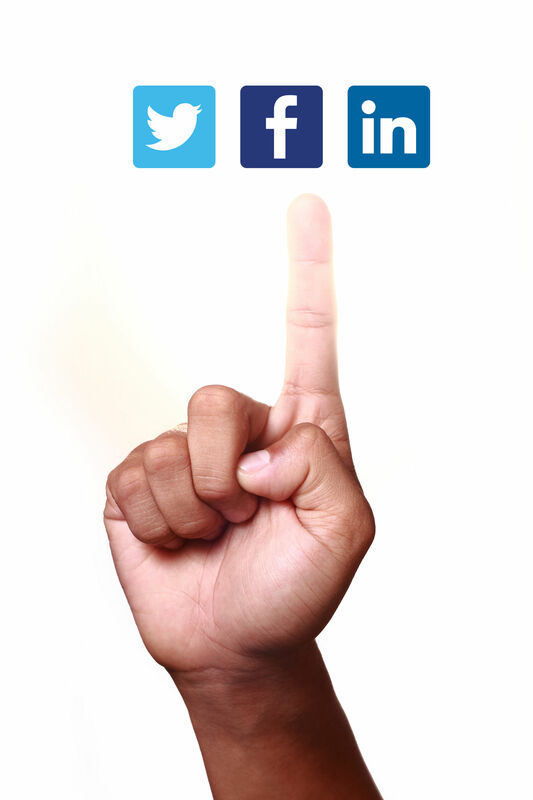 Download our FREE eBook: How to Monitor Social Media In 13 Minutes A Day. In order to successfully monitor social media in just 13 minutes a day, you’ll need to have some things prepared in advance. Even visiting each social network’s URL and logging in could take up to 10 minutes a day. We’ll show you a way you can limit that as much as possible by creating a daily plan upfront to help you streamline your process. If you are considering investing in a paid tool to help aid your monitoring, there are a handful that help with social media monitoring, interacting, and marketing strategy. For example, HubSpot software includes a social media monitoring tool as a part of its complete marketing software package. For now, let’s talk about each social network assuming you don’t have any paid tools readily available. Some free social media monitoring tools you might want to check out include TweetDeck, Google Alerts, Topsy, and Social Mention. Most likely (if you’re taking the free approach), you are looking for industry tweets, @replies, and mentions of your business. Go to twitter.com/search where you can conduct searches for your competitors, industry terms, executives’ names, and whatever else may be relevant to your business. Your Facebook Business Page timeline is the ‘home’ where your business’ fans, friends, customers, and critics can all interact directly with your company. They can post questions, comments, feedback, or fan mail. Fellow fans of your business may interact with each other, as well. Many individuals will interact with the content your business has posted itself. If you’re monitoring for a brand, make sure to check comments on LinkedIn Company Page posts. You’ll likely find the volume here is much less than that of Twitter and Facebook, but you’ll still receive comments occasionally and you should be aware and on the lookout for those that need answers. If someone posts a question about your company and there is no representation from your company among a stream of answers, that is a lost opportunity to guide the message (or deflect negative sentiment). Add your company’s name as a Google Alert to find these types of questions and inquiries. Click The Image Below To Download Our FREE Ebook That includes a Daily Checklist. For more ideas check out How To Build A Marketing Program. We received spot-on assessment, analysis, advice and execution assistance from Analytics That Profit. I couldn't ask for more. Best, direction and insight around. - Thanks!